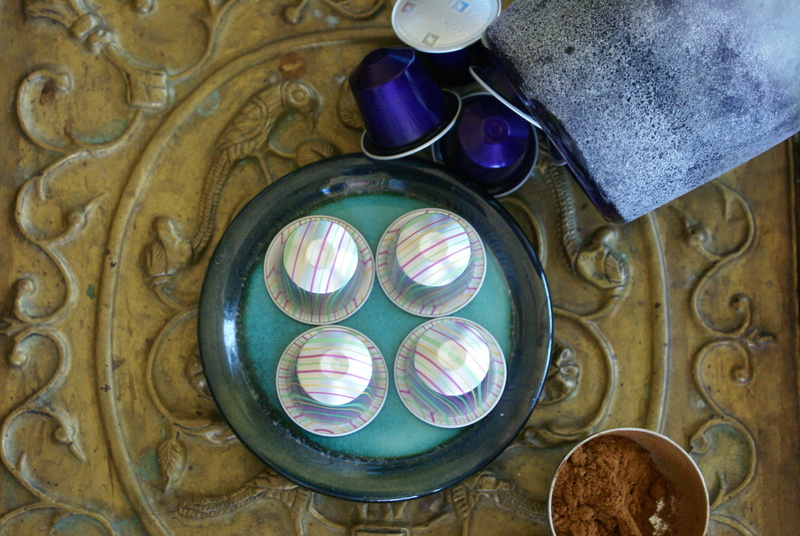 My beloved, blissful decoction of ginger, star anise, cinnamon, peppercorn and cardamom in a multi-striped capsule from Nespresso is gone, gone, gone. 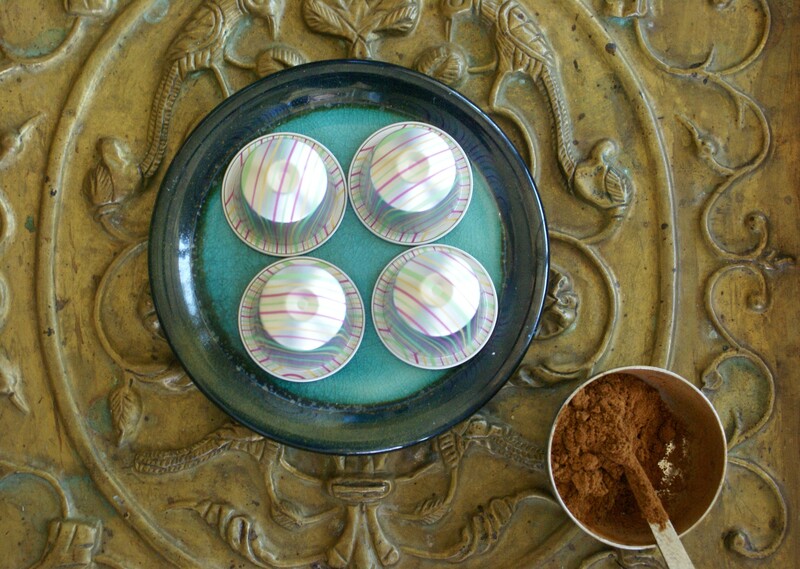 A limited edition, which sold out during the holidays, Masala Chai, swooned me with her rich sweet taste, velvety consistency and soothing aroma from my first sip. I daydream about her as I write this—what I would give for a scant shot glass of her right now topped off with rich coconut milk and a sprinkle of cinnamon. I savor coffee only on weekends when I can cup it into my two hands and enjoy it in a ceramic vessel while lounging in my nest. I especially miss her company while I embark on my Clean adventure this month—no coffee, among many other food exculsions. While I struggle for growth and maintain discipline on this twenty-one day cruise, I convince myself that I can control my thoughts and that the shiny, striped capsule of pleasure is just a state of mind. My mind wonders to a green goddess drink, packed with nature’s goodness and a boost of pure energy without the negative effects of caffeine. The crisp apple provides an incredible sweetness, but lets face the facts—it’s no replacement to a cup of Joe. I focus my attention to nature…when in doubt step out and experience nature and all her glory. She gives lavishly even when we are destructive. She’s not afraid to struggle for growth; in fact it’s the groundwork of her vitality, yet we are not as heroic when it comes to developmental challenges in our lives. We prefer to use crutches to help us through our strife. Nothing in the wild troubles themselves with premeditation and grief. Before a leave falls to the ground it rocks back and forth and abruptly a breeze sweeps it and whoop, there it is, up and around again. Eventually when it settles to the ground, it valiantly starts the toil of decomposition. Wishing you more harmony with your convictions and a little more peace in your nest. How will you grow? Will you be fiercely courageous and creative like a tuft of grass peering through the cracks of the street modeling its own pocket of happiness despite its current situation? Honor your moment with nature and you will find all that you need. Courage to all who have set sail for a new beginning or new goals in 2014…honor yourself and stick to it! No caffeine? Yikes, I get a headache just thinking of it. I don’t drink coffee, but I do enjoy tea. Good luck! Thank you for your support. It’s easier during the week when I don’t have the luxury of time to sit and enjoy it. Enjoy your caffeinated tea. Thank you proskopi! I’m touched you stop by! Have a wonderful day! Thanks. I did it last year, I can do it again. Although I did have a sip of a friend’s cappuccino at an event where the barista, recently transplanted from Italy, convinced me that it was coffee d’ oro. I figured I might as well take a sip for taste sake–it was the most perfect cappuccino I had ever tasted. Ten days completed with eleven more days to go–no headaches so far. Ha, ha–I knew I would. Maybe one day I will have the opportunity to actually visit a chai wallah and experience the real flavor of a masala. Good for you for taking on such a healthy challenge! So often the goals we set that are best for us are also the hardest to accomplish! You’ve written a beautiful challenge and encouragement. I think sometimes it does take boldness to change our patterns, and I really like the way you’ve used the beauty of nature to illustrate your points. This is a lovely post. Thank you for your kind words and encouragement. I’m in the home stretch now and it feels great. It’s ironic how this boldness is bringing me closer to breathing lighter! Thank you so much for your encouragement. I know I have so much energy and don’t feel as drained (also because I have eliminated other foods) however, it’s the taste I miss really. Nine more days to go!